Karnatak Lingayat Education Society was founded in 1916 by seven educated youth with the objective of bringing education to the Kannada-speaking region of the erstwhile Bombay Presidency and what is today the North Karnataka region. Headquartered at Belgaum, & runs over 238 educational institutions all over the world. K.L.E Society's C.B.Kolli Polytechnic has been established in 1984 with an objective to impart high quality technical education along with professional ethics and values.The college is situated in the outskirts of Haveri city on Pune Bangalore National Highway. The Institute is a self financed non minority Institute recognized by AICTE, New Delhi & Government of Karnataka. 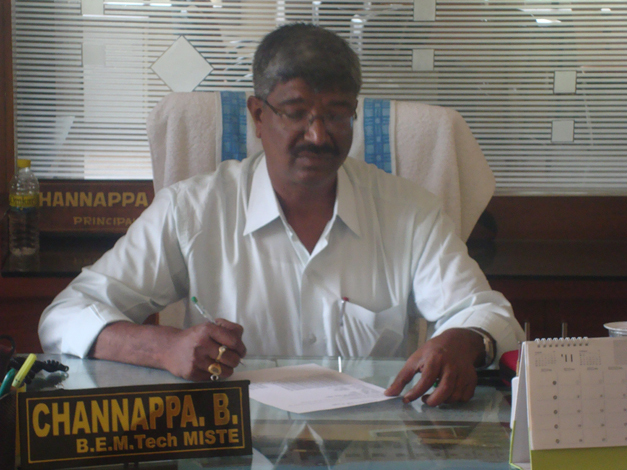 It is affiliated to Board of Technical Education, Bangalore. Haveri district has a very rich culture and tradition. The district is proud to be the birth place of Santa Shishunala Sharif, great saint Kanakadasaru, Sarvagnya, Hanagal Kumara Shivayogigalu, Wagish Panditaru, Writer Galaganatharu, Ganayogi Panchakshari Gavayigalu, Gnyana Peetha Awardee Dr.V.K.Gokak and many more. Our Polytechnic offers students from all over the world a dynamic, supportive and creative environment in which they are encouraged by a committed staff, to pursue personal excellence in academic pursuits, resulting in enhanced prospects for career development. I regard this privilege to serve as principal as an opportunity to uphold and build on the traditions of discipline, honesty and hard work, the qualities which have made this college the unique institution it is. I welcome all to come and visit us to see what a happy, vibrant and promising atmosphere we have.